We need to maintain membership so you guys can continue to do what we can’t do – express the side of the story highlighting the needs of those who create jobs. The Senate co-sponsors of SB-188 have come forth with a “strike-below” amendment to SB-188, which they will present Tuesday afternoon to the Senate Finance Committee in response to serious concerns expressed by the Colorado Chamber and other business organizations as well as worries among some Senate Democrats. A “strike-below” amendment is, essentially, a brand-new bill under the title of the introduced bill. The Senate sponsors of the Family and Medical Leave Insurance (FAMLI) Act are Senator Faith Winter (D-Thornton) and Senator Angela Williams (D-Denver). The Legislative Council will presumably issue a new Fiscal Note for the new version of the bill before the hearing, which begins at 2 p.m. (4/9/19) in Senate Committee Room 357. As amended by the Senate Business, Labor and Technology Committee, the bill creates inequities between public and private employers and public- and private-sector workers. State and local governments will get a “discount,” on their share of the FAMLI premium. The strike-below amendment will allow state and local governments to opt-out of the FAMLI program but does not allow private employers or employees to opt out. The FAMLI Division would require than an employer’s plan match or exceed the exact requirements as the state program to be approved. Most employers’ benefits may cover family-and-medical leave in some way, but will either exceed or lag the proposed FAMLI requirements. Each employer will have to re-tool, or customize, their plans to meet the state’s requirements to be approved to opt-out of the FAMLI plan. The expense to an employer to create a new plan to meet the FAMLI requirements could be considerable. The employer will have pay a fee to the FAMLI Division to have its application processed and authorizes the FAMLI Division director to determine the fee based on incurred costs. Under the new FAMLI bill, a worker has to be on the job for three months, which is 680 hours, before the individual becomes eligible for leave. FMLA, meanwhile, requires 1,280 hours or one year on the job. Governor Polis’ leave proposal for state government workers also requires 1,280 hours or one year on the job. The bill will allow a worker to take leave from different employers if they work at multiple jobs, which creates a “stacking of leave” that the Chamber strongly opposes. The FMLA exempts firms with fewer than 50 workers because the Congress recognized the fiscal burden that imposing a family-and-medical leave on small firms would cause. Not so the Colorado FAMLI bill: All small employers must participate. In addition, small employers must hold the position of an absent worker out on medical-and-family leave open for duration of the leave. Doing this is a huge cost burden for a small business because it may have to hire a temporary worker, who may not have the skills and training for the position and will thus require training, while the employee is on leave. The introduced version of the bill was accompanied by a Fiscal Note that projected that the total premium revenue that would be paid to the FAMLI Program, once it was up and running, would be almost one billion dollars. A new fiscal note has yet to be released to address the new changes adopted in the last committee. For employers, who would have had to pay half of that amount, it would mean that the cost of doing business in Colorado would go up by $500 million dollars. The bill allows for 12-to-16 weeks of leave, which exceeds the 12-week FMLA limit. The bill stipulates that the normal limit for leave is 12 weeks, but a worker could take another two weeks for a separate, qualifying event. And a worker who experiences complications with a pregnancy and birth could take two more weeks. By contrast, Governor Polis has proposed allowing state workers to take up to eight weeks of leave. In short, the Chamber and its business allies are confronting yet another effort by the legislature to create a program that treats businesses more harshly than it would state and local governments. First, the bill has always deviated from the definition of family contained in the FMLA and was overly broad. The sponsors have improved this provision, but the new amendment to the bill would allow an employee to take 12-to-16 weeks of leave for a relationship “intended to last indefinitely” which is unrealistic and incredibly broad. All employees and private-sector employers will be required to pay for the FAMLI program. But no actuarial analysis on the total cost to all employers has been conducted nor is there a reliable assessment on utilization rates. In other words, it is very likely that the second Fiscal Note will again only contain a projection of revenue to the FAMLI Program and a projection of how much money will be paid out in benefits to workers. It will not provide a projection on the actual cost to private sector employers. Employers should be very worried about the cost of this proposal, yet no effort is being made to determine that cost from on a sound, actuarial basis. “Paid family leave is in trouble in the Colorado Senate. Democrats hope changes will turn it around,” by Nic Garcia, The Denver Post, April 5th. Section 3 specifies considerations that the air quality control commission is to take into account in implementing policies and promulgating rules to reduce greenhouse gas pollution, including the benefits of compliance and the equitable distribution of those benefits, the costs of compliance, opportunities to incentivize clean energy in transitioning communities, and the potential to enhance the resilience of Colorado’s communities and natural resources to climate impacts. The commission will consult with the public utilities commission with regard to rules that affect the providers of retail electricity in Colorado. Thank you, Madam Vice Chair, members of the committee, Madam Speaker and Madam Chair, my name is Bill Skewes and I am here representing the Colorado Chamber of Commerce in opposition to House Bill 1261. 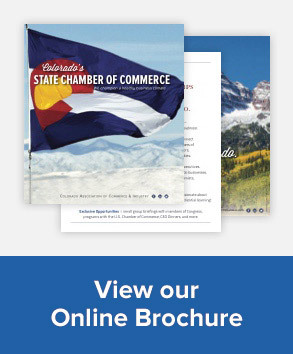 The Colorado Chamber of Commerce represents hundreds of business of all different sizes from across Colorado, as well as over 40 local chambers of commerce and 39 trade associations. The Chamber’s Energy & Environment Council voted to oppose House Bill 1261 based on a number of concerns. However, first, Madam Speaker I would like to thank you for taking the time to meet with us and your willingness to listen to our concerns. We are hopeful we may see some of those concerns addressed through amendments. Our Council’s first concern is the breath and vagueness of the authority granted to the Air Quality Control Commission in the bill. We have questions about the General Assembly’s intent in how the Air Quality Control Commission should meet the greenhouse gas pollution reduction goals outlined in the bill and we would like to better understand how the process to reach those goals will work. It is our understanding that the bill is designed to address major source emissions and we believe limiting the rule making authority to major sources would help our members better understand what the process is intended to look like. Second, our members are concerned with the potential costs associated with any rule making authorized in the bill. Colorado may be successful in reducing greenhouse gas pollution by 90% by 2050, but at what cost? While the legislative declaration includes guidance “to require the use of all available practical methods which are technologically feasible and economically reasonable” to reduce greenhouse gas pollution in Colorado, we believe including similar language in section three of the bill that directs the Air Quality Control Commission to promulgate rules and regulations to reach those goals would be beneficial. Third, we believe the bill should be amended to provide additional oversight by the General Assembly. Currently, the only future oversight by the General Assembly will be the annual rule review bill and a report in every odd-numbered year by the Air Pollution Control Division on the State’s progress toward meeting the greenhouse gas reduction goals. We believe there should be additional oversight and approval by the General Assembly in how the Air Quality Control Commission is attempting to meet the goals to ensure the General Assembly approves of the Commission’s direction. Finally, the vast majority of greenhouse gases are by definition ubiquitous in the ambient air and all people are exposed to them equally. These gases are not limited by geographic boundaries and other than rural communities dependent on coal mining that might be disproportionately impacted by the bill’s direction toward cleaner energy sources, we do not understand how certain communities will be disproportionately impacted as set forth in the legislative declaration and would ask that such language be clarified. Thank you and I am happy to try to answer any questions. 90 percent reduction by 2050. The Air Quality Control Commission (AQCC) in the Colorado Department of Public Health and Environment (CDPHE) is required to adopt rules and regulations for statewide greenhouse gas pollution reduction. Rules must take into account other relevant laws and rules, as well as voluntary actions taken by local communities and the public sector, to enhance the efficiency and cost-effectiveness of the adopted rules. The rules must provide for ongoing tracking of emission sources and include strategies designed to achieve reductions in harmful air pollution. The Air Pollution Control Division in the CDPHE is required to solicit input from other state agencies, stakeholders, and the public on the advantages of different statewide GHG pollution mitigation measures. The division will report to the General Assembly every odd-numbered year on the progress toward the goals listed above. Clean energy plans. The AQCC is required to consult with the Public Utilities Commission (PUC) in the Department of Regulatory Agencies in designing, implementing, and enforcing programs and requirements. The AQCC and division are also required to consider any clean energy plan at the PUC designed to achieve at least an 80 percent reduction in GHG emissions caused by the utility’s Colorado retail electricity sales by 2030, relative to 2005 levels. April 10th: Kurt Morrison, Deputy Attorney General – Mr. Morrison will be discussing and answering questions regarding HB 1289 (Consumer Protection Act) which is the Attorney General’s priority bill. Please visit our online calendar for a complete list of council meetings.